Select the number of vents assemblies below (even numbers are recommended when possible). Vent Fan Color - Please select from the available colors on the drop down or request a different color and we will see what we can do. Please choose a second DIFFERENT COLOR CHOICE that can be used if your first choice is out of stock. Only one cable is necessary for the vent fans. Only one power cable is needed for the vent fans. Please indicate the telescope type and approximate distance between vents. The TEMP-estTMRetrofit System consists of two or more small vents and fans. The vent fan system is designed to be run while using the telescope and employs at least one filtered fan to pull air out of the OTA and another filtered fan to push air into the OTA. Any number of vent fans may be employed depending on the users needs and OTA size. The filtered fans use a 55 micron stainless steel filter to keep dust input to a minimum. The filter can be removed from the exhausting fan(s) by the end user to increase air flow. The vent fan systems run off of standard 12VDC with a 2.1mm center positive plug and the vent fans are wired together so that only one power supply is need to run both vents. The vents come in one size (approximately 47mm in diameter). The vents use 25mm fans rated at 3.0 cfm. The fans being used for the vents are high quality magnetic levitation fans that offer the highest flow while minimizing vibration. The purpose of the vent fan system is to help the primary mirror and interior air remain as close to ambient temperature as possible in order to minimize the formation of tube currents in the OTA, to break up tube currents that may form, and to do this while using the scope for viewing and imaging. The fans can be installed using a 1-3/8 inch (35mm) bi-metal hole saw or step drill bit. A pilot bit is recommended with the hole saws. A 1/4 inch and a 1/2" drill are generally needed to install the power socket. These drills and hole saws are generally easily available at local hardware and home improvement stores. Quick connects have been used for the power connections to eliminate the need for soldering. Each vent assembly is custom CNC-machined and made from materials like solid surface acrylic polymer and recycled materials are used when available. The vents can be made in a variety of colors depending on available supplies. Installation services are also available for these fans. Please ask for a quote for those services. 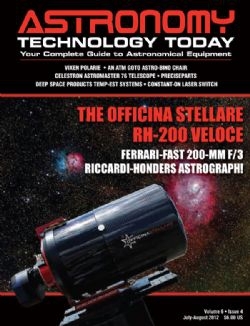 Read the report on the TEMP-est Systems in the July-August 2012 issue of Astronomy Technology Today by clicking on the cover below.